Every new generation knows better than the one that came before. This is a natural law. According to this law, modern dads are doing a much better job than their own fathers who lived in the bad old days and did everything wrong. I’m all for praising today’s dads but isn’t it time to stop dismissing the merits of the older generation? When I hear how fathers of 40+ years ago are characterised, I do not recognise my father or the fathers of my friends and extended family growing up. Distant, authoritarian, unwilling to push the pram or lift a finger at home – well they weren’t all like that. There have always been dads who sang lullabies, gave bottles and played with their young children. Dads who cleared the table and did the washing up. Dads who did the grocery shopping and took the children to swimming classes. Dads who appreciated their children and understood them, were openly proud of them and affectionate. Dads like mine. And even if they weren’t hands-on with the children and the household, think of all the fathers who gladly let the kids shadow them around the farm, teaching them important skills, or the ones who did all the driving and photographing on family holidays, or worked in jobs they didn’t enjoy or spent lonely months away as migrant workers to provide for their families. Sure, we can judge the fathers of the past and find them wanting. Some were selfish and unkind, human traits that have not disappeared with black and white television. But mostly they were good men who made sacrifices and loved their children above all. There is more to fatherhood than proudly parading your cute baby in the park. It’s a job for life and the dads who’ve been around the longest have done the most, taught us through the good times and the bad times to be better people. I hope you agree with me that good fathers are nothing new. On the subject of fatherly love, here’s a William Wordsworth poem you probably all know but is well worth reading again. 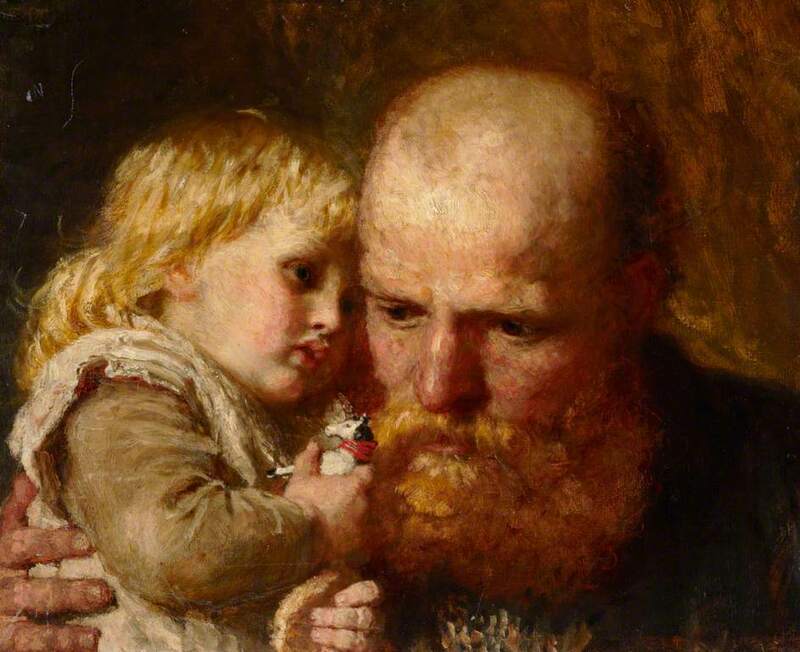 The sonnet was written two hundred years ago in the aftermath of the death of his three-year-old daughter and “heart’s best treasure”, Catherine. Well said, Clare. An excellent post. My dad was old-style. He didn’t change my diapers; he was in Europe fighting Hitler. He didn’t wash the dinner dishes, but he cooked our breakfast and made sure we caught the school bus so Mom could sleep in. He didn’t read to me (not that I remember), but he told me adventurous bedtime stories. There are a huge variety of ways to be a good dad. That’s very touching Nicki. It’s the relationship that counts and the example they set too. Families are complex and not every father was a slave to gender roles. For all the talk, I don’t think the mother/father dynamics have changed that fundamentally. Well said, Clare. Thankfully, I also had a ‘hands on’ Dad and unlike in the case of my Mum, I can never remember him losing his temper with 3 girls and a boy. Lovely post. Thanks Safia. Interesting, I could say the same about my parents. I just don’t like these sweeping generalisations. If the older generation has to be judged, at least let it be done in context.